How do you like your calamari? Acadia lets us know her preference! 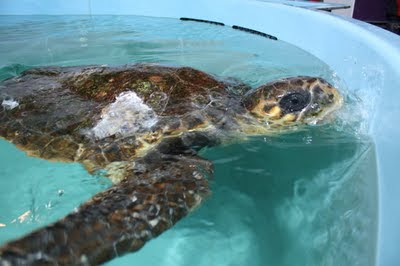 Acadia, the loggerhead sea turtle, is adjusting well to her tank. We took her out on Thursday to run blood work, do an exam, and give more fluids. Getting her out of the pool is no easy task! While Acadia was out of her tank and after we received results from taking her blood, we performed an exam and gave her more fluids. Then she was placed back in her tank (a much easier process than getting her out). Our next task was to start feeding. Usually turtles are slow to start eating so it was no surprise that she turned her back on the herring I offered later that afternoon. By Friday afternoon, Acadia decided squid was her preference and began to eat. No need to fry or grill calamari for her, she takes it raw! Today she even began to eat whole herring. This is an excellent sign! We will check her blood work again early next week and continue to monitor her progress. Check back for updates! This is awesome. Just to think a week ago our girl was lost in Drummer Cove and now she is eating again and swimming like a champ. I imagine she will even be able to swim even faster with all those barnacles removed. I hope she has a great reunion with all her pals in the southern waters!